Applying these simple rules ensures a valid Data Flow Model. So let us apply these rules to our Level 1 DFD. Rule 2: Function 1: YES - it does have all the information it needs. It only needs order details to produce its output - invoice. Function 2: NO - it does not have all the information it needs to produce its output (receipt). So we must apply Rule 3 to Function 2. Rule 3: Function 2 has payment details but it also needs order details so that it can match up payment with order. So where will it get information from? 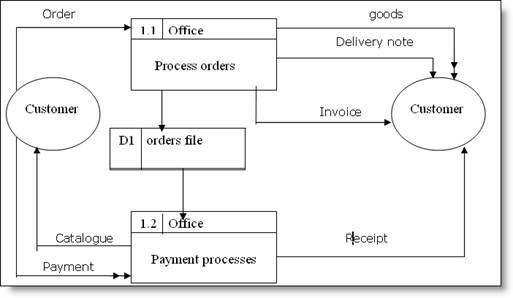 We can see that Function 1 receives order details from the customer, so it must receive order details from Function 1. We have used the data store symbol to show the stored orders. Note that Function 1 creates the order data store and Function 2 reads the data store. Note also how important it is to apply all the rules - if we only applied the main rule (ie all functions to input and output), the diagram would have been incomplete.